When we heard that two of our favourite brands The Kooples and Puma were doing a collaboration, excitement and curiosity took over and we couldn't wait to see what the two had dreamed up. They certainly didn't disappoint either, a Puma style sneaker combined with The Kooples' rock'n roll androgynous edge, the classic clyde design, reinterpreted in black & white and stamped with The Kooples' signature silver skull, classic, simple and super comfortable, just how we like it! The Kooples has always been a brand Loanne and I have loved. The brands Parisian charm combined with British heritage cool makes it an iconic brand like no other. Added to which their genius campaigns of using 'pairs' and 'couples' is a sure winner for us! We hadn't visited Paris for a year so it was lovely to come back and visit the city of love although the weather was a little hit and miss. We were lucky enough to meet the founders of The Kooples: three brothers - Alexandre, Laurent and Raphaël Elicha, who are all seriously the epitome of cool and all oozing charisma & charm, the perfect Kooples ambassadors! 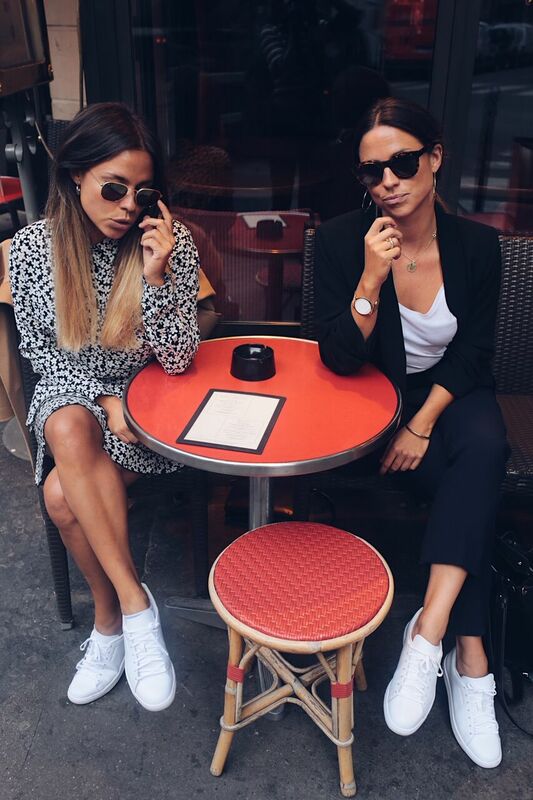 We had a bit of time before the party to take a few snaps around the Parisian streets. Loanne and I decided to go for two different looks, I chose the more feminine & flirty look which comprised of a daisy shirt and skirt. (Yes, it looks like a dress but they are actually two separates! ) Whereas Loanne went for the more androgynous, cool look by wearing navy blue trousers with velvet detailing, a simple white Kooples t-shirt and a black blazer with the white clyde trainers. We've decided to include a few more snaps of us repping The Kooples. The black and white stills you may recognise from our recent shoot with Vogue Germany and the final photo when we spent last Christmas in Mauritius. Our Kooples items sure have travelled the globe with us, the pieces are so timeless and chic that you can wear them anywhere and at any time! We can't wait to discover their next collaboration and to continue filling our wardrobe with more of their dreamy items!